My love of writing has grown from my love of reading, and like many writers, I write the kind of books I would love to read. In my early years of writing, I enjoyed several novels by Bernard Cornwell, and took some valuable writing advice from his website. To paraphrase, he said that when you want to understand how something is made, you take it apart, and so it is with novels. Pick a novel you love, one that you wish you had written because it resonates deeply with you long after you’ve finished reading it. And then unpack it. I’m not talking about the way we did back in English literature classes at school or university, but in the way a writer needs to. The story, the structure, the way characters get themselves into situations and why, and how long it takes them to get through the path of obstacles you have created for them. This is the eleventh in this series of blog-posts about writing a novel, and what I’ve written in the previous ten all have relevance, but this is where the fruits of those come together in a loose mesh which can be tugged, stretched and made to fit by doing some research and a bit of juggling. The best way to analyse your own novel is by comparing it to novels that you wish you had written. What is their secret? How did those authors manage to hit all the right buttons in exactly the right places? Unpack it and see. I have always loved the movies, and long before I started buying books on writing, I bought books on how movie structure worked. 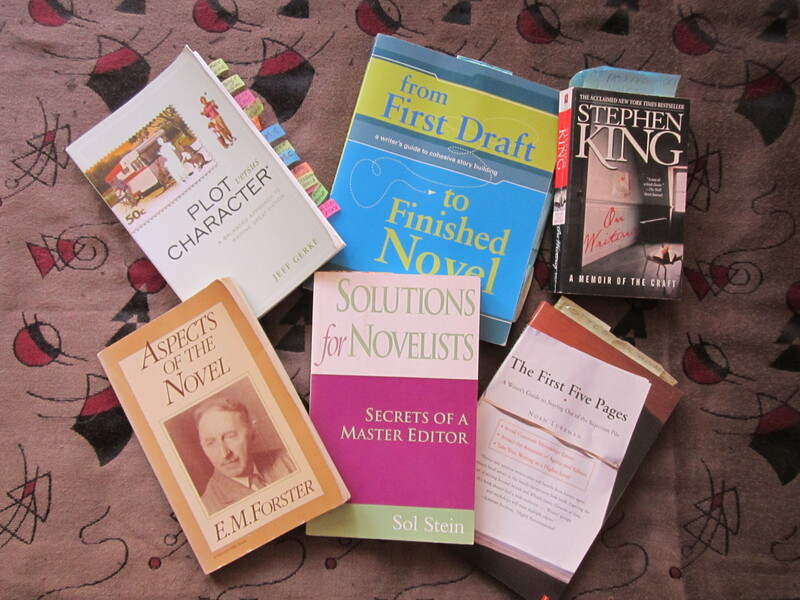 Many of my favourite books on writing are still the ones about screenplay structure, and much of what I now think of as my checklists and story patterns for writing my novels come from reading those books. 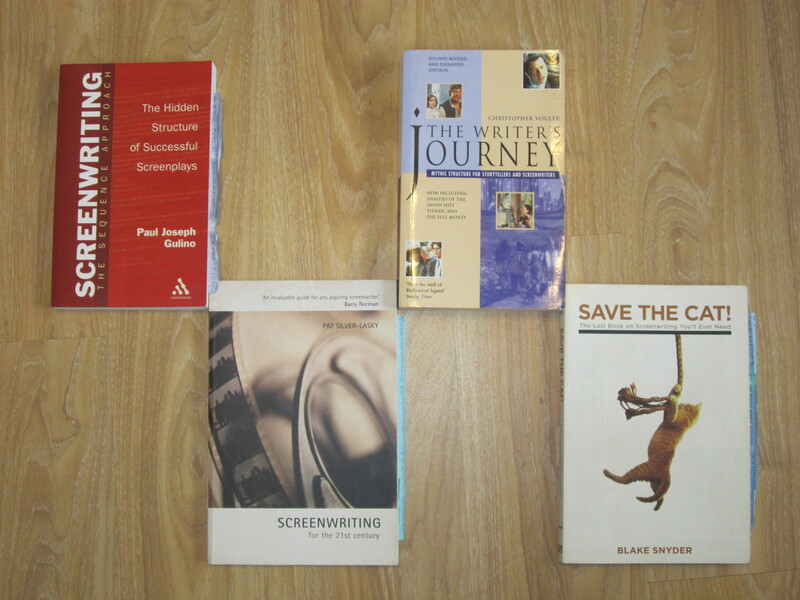 I always have: a three-act structure (Screenwriting for the 21st Century by Pat Silver-Lasky); a hero’s journey (The Writer’s Journey by Christopher Vogler); a sequence of sequences (Screenwriting: the Sequence Approach by Paul Joseph Gulino); and a beat sheet (Save the Cat! by Blake Snyder). From these I have, over the years, devised my own basic structure, and now that I’m struggling with the ratios and proportions of my latest novel, it’s Blake Snyder’s beat sheet that I’m using to analyse (and hopefully fix) the problems I’ve encountered. Following Bernard Cornwell’s advice to new writers, spend some of your precious writing time unpacking three or four novels you’ve loved and wish that you’d written. Try to use works from different authors, all of whom have written in the genre you love to read and are writing in. Re-read each novel carefully, notebook in hand. Read like a critical writer, not like a loving reader. How long does it take to reach the catalyst or inciting incident? How long does the hero debate before making the decision to take action? At what point do the Bad Guys start to turn even nastier? Is there a significant Midpoint which either foreshadows the outcome or gives the reader the exact mirror-image of what the ending will be? Which scenes are written in full, and which are summarized to move the action along at a faster pace? How long is the third act, or finale? Knowing the novel because you’ve already read it at least once, pinpoint exactly when and where each tiny slice of foreshadowing takes place. A master craftsman plants various ideas and hints throughout the entire novel, in such a way that the reader sees the fruition of those seeds as being the perfect denouement and not as a nasty, unrelated, out-of-left-field surprise. Master storytellers also weave an undercurrent of tension throughout, which we glimpse at appropriate moments – a ticking clock, a war or revolution taking place in the background, and so on. Make notes on how they do it. Another thing to make notes about is how subtle the love scenes are. My current favourite love scene is in one of the Amelia Peabody books by Elizabeth Peters: The Falcon at the Portal. It is 60% of the way through the text, and is exactly three sentences long. Because Peters has built the tension so well between the two characters up to that point, she needs only three sentences. The first is the start of the girl’s run across the room towards him, the second is their moment of meeting halfway, and the third is later when they are curled up together in bed and he wipes away one of her tears of happiness. Who needs more than that? No one needs more if the path to get there has been planted properly. Satisfaction all round. Now let’s get to the horrid part of this exercise: the cringe moments when you compare these notes to your own work-in-progress. Take comfort here from the fact that your work is still actually “in progress” and it’s not finished until you’ve finished working on it. Take more comfort from knowing that those famous novels had a team of editors and beta-readers all making suggestions to the author and helping to hone the final product long before you read it. How far into the novel is your inciting incident? How long does your hero take to make the decision to go on the journey? How wordy and purply is your love scene? Does your Midpoint actually happen exactly at the 50% mark or does the first half of the novel seem to take forever? (Take heart, people – this is always MY big problem area!) Which scenes need pruning, and which can be reduced to summaries instead of slowing the pace? With the notes you have made of how other authors make their novels work, and with the help of your outline, timeline and character sketches – all of which you made before you started yours – you will be able to find the right places to tweak and twist your work so that it all happens where it should, and in a much more satisfying way. Writing a novel can be a long process, and sometimes we writers can’t tell how the pace is going because we are too close to it. As much as I love having an outline from which to work, the important thing to remember is that it is – at best – a flat, two dimensional map of where the novel is going, and what the most important points in the plot are. What happens when the writing of that plot doesn’t work as well in practice as it does in theory? Sometimes a particular section of my current draft which may have worked well in the outline, doesn’t ring true in the actual writing. If I can’t solve it immediately, I highlight that section on my outline, leave it and move on to the next plot point, which often shows me the way back to solving the previous problem. If it doesn’t, then maybe the sequence of events is in the wrong order. Some writers do their outline on a series of cards – one scene per card – so the cards can be re-arranged if the order isn’t working. Personally, I don’t like using cards. I find it easier to cut and paste on my outline instead, but if cards work for you, then by all means use them. Here’s a thought: if something is difficult or boring to write, then maybe it shouldn’t be in the book because it may be boring or difficult to read. It’s that simple: if there’s a boring bit I can’t write, then maybe it’s not meant to be written. Maybe the idea behind that scene or sequence needs to be reworked in another way. So back I go to my original one-page synopsis and examine where that problem scene fits in the greater story. What happens before it? What happens after it? Is there a better way to get from one point to the next? Remember that every character has a desire, and has to overcome obstacles to get what he or she wants. If the obstacle isn’t big enough then the writer must either raise the stakes and make it big enough to count, or wipe it off the slate and get on with the story. The writer must choose between scene and summary. Not every step of the story needs to be written as a scene; some can be summarized to move the reader forward to the next interesting bit. Ask yourself: What am I trying to say in this ill-fitting scene? Where is it supposed to lead to? If there is a better way to reveal what’s in it, then why is this scene even in the book? If a lacklustre scene serves a definite purpose, then that purpose might be better presented in the form of a summary. Perhaps the characters need to go on a journey for a reason, but unless there’s something significant that the reader needs to witness along the way, or if the tension is heightened by the fact that they are being followed, then we don’t need to see every step of the journey, especially if it’s going to hold up the action and bore the reader. Rather end the chapter as the characters leave one place, and start the next chapter as they check into the hotel or arrive in the city where the next bit of action will happen. While writing Benicio’s Bequest, I had a complicated sequence of events in which my two main characters travelled back and forth across the same section of Italy several times. By highlighting the problem areas in my outline, I was able to rework the sequence with one less travel hop, and turn one of them into a car chase, thus tightening the action and putting them in the right place in time for the final push to the finale. Most plots need moments of quiet time to let the characters (and the readers) take a breath. In a romance this is often when the characters get to know each other better, but don’t linger there too long. Keep them on their feet and dancing through the plot, because that’s how it stays interesting. Plenty of time for them to get to know each other properly once they’ve saved the world! It all comes down to a balance between pace and progression. Those writers who advise you to “leave out the boring bits” usually have a good grasp on how to keep an audience engaged. Keep the pace moving, while constantly advancing the plot. What do you do with those lovingly-crafted scenes that don’t advance the plot, but that you’ve written so well and can’t bear to lose? Here’s my solution: I cut and paste them into a folder called the Dumping File. I tell myself that they are not wasted, and sometimes I even get to use bits of them in another part of the novel. I haven’t killed them, because they’re still there on my computer. These deleted scenes form part of each novel’s backstory, and my own writing journey. Even though the reader doesn’t need them, I’ve still got them, kept all safe and cosy and protected. The dumping file for each of my novels is quite large – between 15 and 30% of the size of the finished novel – yet every bit of them turned out to be completely unnecessary. In this series on the writing of a novel, I’ve already covered setting here and characters here. Now comes the fun part of putting it all together into an actual story – the synopsis. Despite dealing with setting, characters and synopsis one by one, it’s important to remember that the creation of a novel never moves evenly, one complete step at a time. Rather, it is a mix of various steps taken bit-by-bit, and usually simultaneously. 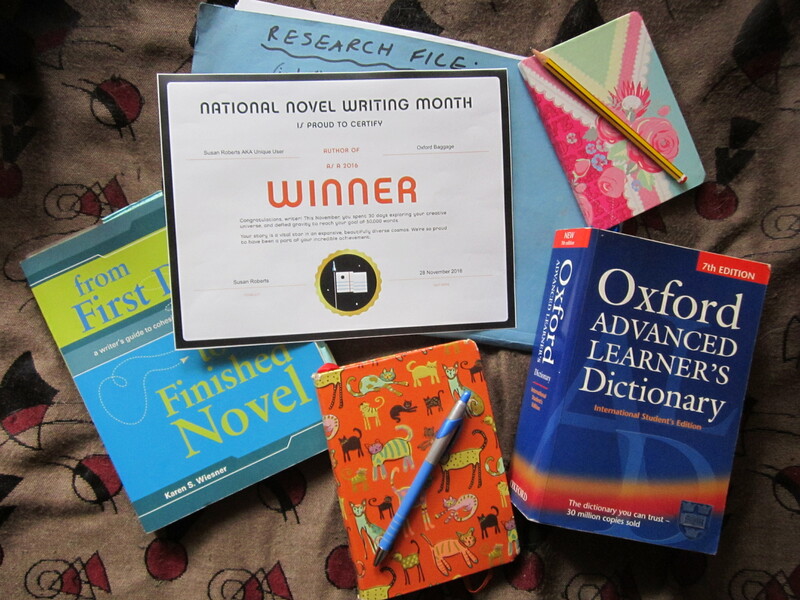 Due to the wonderfully invigorating interruption of NaNoWriMo last month, it’s been two months since I last wrote a blog-post about this novel-writing process. It’s probably just as well that I waited an extra month before writing this, because the synopsis for my current novel evolved so much during the month of November. Previously, I explained about the process of creating characters, and how they are invented to enhance and complement the plot. With all of the characters and their setting whirling around in my head, I usually sit down and write a one-page synopsis of the proposed plot action. There will be details to fill in later, more secondary characters and possible changes in setting, but the gist of it will be there. I can’t create fully-rounded characters until I know what they’re up against in the story. Likewise, I can’t invent the perfect synopsis until I have a good idea of how each character’s own desires, goals, habits, quirks and fears will add to that story. The half-formed synopsis I have in my head can only be finalised once the characters have been fleshed out. And once I begin writing the novel, it all changes even more! I write romantic mysteries, so in all my novels there is a mystery which initially draws two unconnected people toward each other, changes all their immediate individual plans and forces them to work together. The solving of this mystery causes them to fall in love, keeps them on the trot and eventually makes them fear for their lives. Along the way I’ll throw in some deception, betrayal and a bad guy who may or may not be likeable at first, and then I’ll wind it all up in a glorious Big Climax from which no one looks set to escape alive, but hopefully the relevant romantic couple will survive with only a few scars, and live happily ever after. I should also mention here that the Big Climax always ends up taking place in a completely different way from how it was first envisaged. This is not for lack of planning, but because so much depends on the characters themselves. Their evolving goals and motivations inevitably change as I write and sometimes they steer the action in a different direction. In my current novel Oxford Baggage the heroine is left a dubious legacy by her late ex-husband – the guardianship of his daughter from a previous marriage. It’s 1955 and Amy has felt bored and directionless since her secret government work ended at the close of the Second World War. She must now travel back to Oxford – the scene of her unhappy marriage to David – and live in his house as stepmother to his sixteen year old daughter for the next nine years until the girl reaches the age of twenty-five and gets her inheritance. That’s the set-up. The mystery? Victoria – the stepdaughter – believes that her father was murdered. The love interest? There are two men: Simon, the lawyer dealing with David’s estate; and Richard, the younger brother of David and uncle to Victoria. Both men have secrets from the war, and Amy is attracted to both, but could one of them have caused the accident that killed David, as Victoria suspects? Or is Victoria just being difficult and trying to stir trouble? When I wrote the original one-page synopsis for this novel, I had no idea about the character of one of these men. By the time I reached the 50,000 word mark at the end of November, I had a better idea of who he was, but I had also realized by then that the entire character of the other had changed along the way. One of my major settings for the novel became largely redundant during the writing of the first draft, when I discovered a setting closer to the heart of the novel, which in itself opened up a channel of history that, when explored, became a far better choice for the plot I had in mind. And if that sounds complicated, wait until we start expanding that one-page synopsis into the outline! The outline is the most important document apart from the manuscript itself, because it will serve as the blueprint for the novel, from day one of writing, until I push the Publish button to turn the finished manuscript into an eBook months, or even years, later. Well, it’s over at last and it was an interesting experience. I clocked up 51,106 words in 28 days, with an average of 1703 words per day. Despite the progress made so far, my story is nowhere near finished. Would I do it again? Yes, if the time frame of starting a first draft ever coincides with the beginning of November again, I will probably join up and give it another go. It’s certainly a good way to get the writing juices flowing. So what have I learned from this experience? Having now proved to myself that I can write over 50,000 words in a month, next time around I wouldn’t attempt to finish the actual draft, but would choose from the start to view those 50,000 words as only part of a draft. I needed to do this, and I’ll always be glad that I joined in and did my best. I had been in a bit of a rut and had been procrastinating for a few months about starting my next novel so NaNoWriMo gave me the incentive to sit down in October, thrash out a storyline from my original synopsis, and flesh out some characters. It gave me a deadline by which to get my initial research done, so that by the end of October I was as ready to roll as it was possible for me to be. The build up to it was fun – signing up to the website and finding some writing buddies, getting emails of encouragement and so on, made it all very festive and encouraging. During the month of November, NaNoWriMo literally gave me a reason to wake up early each morning and write at least 1,667 words before the day intruded with its problems. I had been busy with a soul-annihilating job-search for the previous four months which was – quite frankly – depressing, and I needed an injection of fun in my mornings, but was still free to job-search each afternoon. NaNoWriMo also allowed me to plough through two thirds of a first draft faster than I’ve ever done before, and that’s quite an exhilarating feeling. 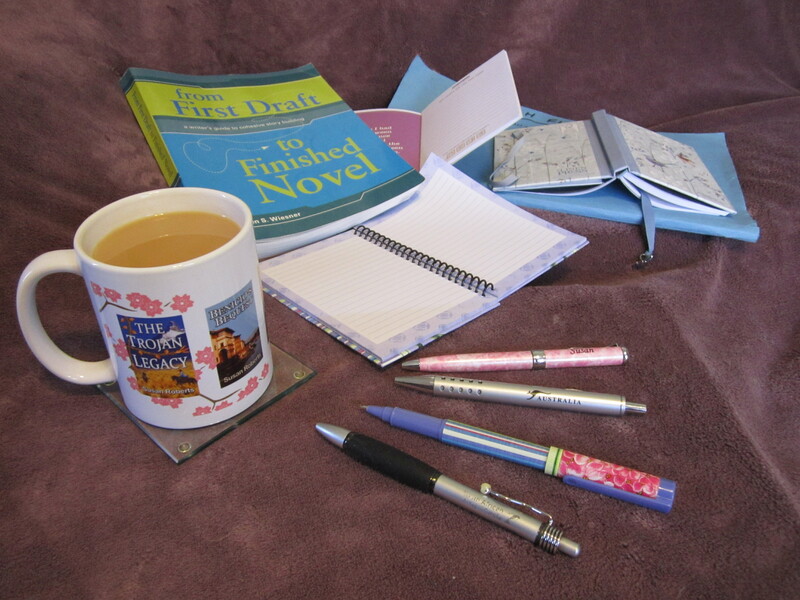 When writing a novel, no matter how prepared I am (and I was for this one, I promise! ), there will always be new ideas that I think of along the way. This happens to me every time, and it’s a good thing. It means I am thinking on my feet, leaving a certain amount of the story to chance, and definitely open to new ideas. It also means that, while I’m writing, I need to adapt my outline constantly as I find new bits to put in. And I need to research those bits before I put them in, because there’s nothing more time-wasting than writing screeds of stuff that I imagine to be possible but haven’t had the time to research properly yet. It’s all very well to type in the words: “research this bit later” and carry on writing, but I don’t want to find out 20,000 words down the track that it’s just not going to work. Ask anyone I’ve ever worked with and they’ll tell you that I really do hate doing a job twice because some idiot didn’t think things through properly the first time. When that thoughtless idiot turns out to be me because I was trying to keep to a pre-determined word count, I want to spit blood and rage at the universe for allowing me to screw myself around like that. And none of that contributes to making me a happy writer. It’s worth taking a week (or even longer) to rethink, re-research and rewrite the bit that doesn’t work in order to progress towards a product that is ultimately better. In Benicio’s Bequest which is set in Italy, I swapped around a trip to Venice and a trip to Florence because the story flowed better when I re-thought that sequence. This involved a certain amount of re-plotting and re-writing of two whole sections, and it all had to be done before I could move on to the next sequence because any change like that has a knock-on effect. The new sequence also gave rise to a car chase that hadn’t been in the original storyline but turned out to be one of its highlights. In The Trojan Legacy I planned the first part of the historic half of the novel to be set in the mountains of Peru, in the jungle near Machu Picchu, but 12,000 words into the first draft I knew it was never going to work because I didn’t have enough personal experience of that place. I decided to re-set that part in the Drakensberg mountains of South Africa which I knew well (and which was one of the settings for later in the story anyway), but it took me a week to reshape the beginning of my story and rewrite that section before I could continue. After two weeks of writing according to my word count I hit a snag at the beginning of the third week. I realised that I needed to research some British history about Elizabeth the First’s persecution of the Catholics, and the construction of secret passages and priest holes in buildings of that time. This took me almost two days and set my word count back considerably. If this had been a normal first draft and not a NaNoWriMo first draft, I wouldn’t have let the lost days and lack of words worry me, but in running to catch up afterwards, my writing became sloppy and sub-standard. One of the other problems I had with the fast pace of NaNoWriMo was that this re-structuring and rewriting is part of what makes writing enjoyable for me. I enjoy the craft of creating something that grows organically and plots its own path no matter what my outline says it should be doing. When this happens, the last thing I want to do is rush to catch up and lose the magic of those moments and the added value they bring to the story. Another of the ultimate joys of writing is when my characters decide to race off on a different path and I have to follow them to find out what they’re up to because they refuse to listen to me or let me dictate their lives. (This is how I ended up with an unscheduled car chase between Florence and Verona in Benicio’s Bequest.) In my current novel, however, my poor strait-jacketed characters haven’t yet had a chance to break out of their constraints. No matter what writers tell you, we all have imaginary conversations running through our heads. The characters converse and the writer has to lunge for pen and paper or phone to scribble it down as fast as those voices are spewing it. This is a sign that our characters really do have a life of their own outside of what we created for them. I remember chuckling at whole discussions between three of the characters in Benicio’s Bequest as members of the same family bickered and argued about past events and what to do next. Unfortunately, that didn’t happen very often in this draft. I don’t write short novels. My novels are always longer than 50,000 words. They end up between 80,000 and 98,000. The last novel was 92,000 when finally ready for publication after ten drafts, but its first draft had been 66,000 words. Come the end of November, my draft wouldn’t be a complete draft, even if I reached 50,000. There would still be at least another 25,000 words to write just to get the basic draft down, and I could fix a lot of things then. It was okay to write two thirds of a draft for NaNoWriMo, because it left me enough of the good stuff to play with after the end of November. With two thirds of the first draft already done, I can now afford to relax a bit, go back and fix things and make some changes where they are needed. I can research at my leisure and take my time with the climax and finale. When I was young, my dad belonged to a film club which used to have “Five Objects” competitions every few months. The filmmakers would be given a list of five completely unrelated objects, and they had to make up a story which included all five things. Each filmmaker had to film their own story, edit it, lay the soundtrack and screen the finished product on the night of the competition. The objects could be introduced in any order, but they had to be more than just arbitrary set dressing in the background – they had to actually play a part in the story. My dad was a good filmmaker and he had a vivid imagination, so his films always did well in those competitions. For days my dad puzzled over scenarios about dogs running off with sausages. Which of our dogs would we use? How could we train it to do something like sausage-stealing and yet prevent this from becoming a habit? And so on. Housewife preparing a pound of sausages, putting them into the frying pan and setting it on the stove. Doorbell rings. She leaves the kitchen and goes to the door. There is an encyclopaedia salesman on the doorstep. He talks his way in with his briefcase of book examples and his car keys. Once inside her lounge he doesn’t stop talking, impressing upon her how important the books will be to her family, blah, blah. She tells him she’s not interested. He takes a long time to accept this, but finally packs up the books and puts them back into his briefcase. Unseen by him, he catches the edge of his key-ring in one of the books and the keys go into the briefcase too. The salesman picks up his briefcase to leave but can’t find his keys. As he searches, the housewife suggests they may be in his briefcase. He tries to open it and realises that he can’t because it’s locked and the keys must be inside. He’s in despair. She tells him not to worry and leaves the room. She comes back with a screwdriver. 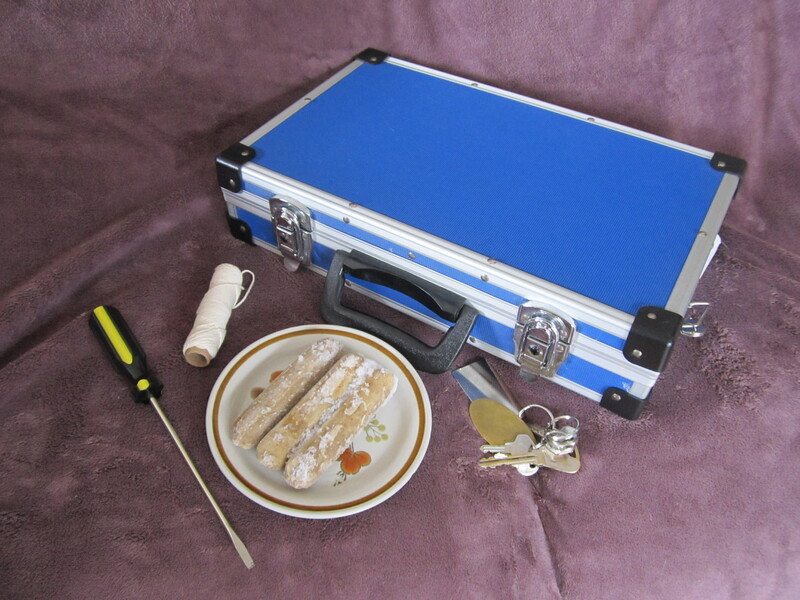 The salesman forces the lock of the briefcase, retrieves his keys with great relief and then realises that he can’t shut the briefcase because the lock is broken. … and that’s when she smells the burning sausages and runs from the room in the other direction. She runs back in, holding a smoking frying pan, and yelling at him. He picks up his briefcase and his keys and runs out the door with the angry housewife in pursuit, still holding the smoking frying pan, trailing smoke behind her. Sometimes my dad would throw his ideas around and ask us for feedback, and when he had the story ready to film, we would all be on hand to move furniture around, help with finding props, move lights on stands, and even become part of the background if he was filming on a not-busy-enough street (which wasn’t necessary with this one). My dog even had a cameo role running up to the gate as the salesman left. (At least we didn’t have to teach the dog how to steal sausages.) We used burning rags for the burning sausages and ate the real ones for supper that night. I know this isn’t the place to wax lyrical about how much I loved all of this – living out my own movie-set/backstage fantasies – but long before we reached the actual filming of any of the stories, we had the fun of dreaming up scenarios like this, thinking of ideas to suit other lists of objects. I’ve been doing this my whole life, really – and I never get tired of it. It finally occurred to me not so long ago that it’s a good way to build up a basic story for a novel. the timeframe or deadline of a ticking clock. Add into the mix two characters each with some kind of desire (and because I write romance they need to later develop a shared desire for each other), and a bad guy with crazy ambitions, and there’s bound to be a story worth writing. I love all these enticing ingredients and the challenge they present. I’m a writer of long, rather than short, stories – I have too much that I want to throw into the pot. When I look back at all of my successful novels, each one has those five ingredients. Even my historical novella From Daisy with Love (which is a romance but not a mystery), has all of the ingredients – the historical artefact would be the box of written letters and objects for a future generation to find, and the bad guy (although slightly removed) would be Kaiser Wilhelm II who was responsible for the war which changed the lives of all the characters. However, if I look at my two earlier trunk novels it is now easy for me to see why they didn’t work and were never good enough to be published. They are both missing several of the vital ingredients. One day I still mean to re-write both of them but don’t hold your breath because newer stories pop into my head all the time. To those who love reading books written by others: do you recognise any of these five ingredients in your favourite books? I do. Lord of the Rings, The Chronicles of Narnia, The Forgotten Garden, The Goldfinch, My Brother Michael, The Girl You Left Behind, and so many more, from the Amelia Peabody series right back to some of the Enid Blyton books I used to read as a child. To any writers reading this: what five ingredients do you consider essential in your novels? Hi there – you don’t know me, but I wish I knew you. I sometimes feel as if I do, but maybe that’s because I’ve seen many of your films, and we share a birthday. Well, technically we don’t – I was born two days before you in South Africa and you were born in New Zealand and given the time difference that probably makes me closer to three days older than you. Anyway, never mind that. Let’s just say that we were born a few days apart in the same year. And we both grew up loving movies. …and then came Lord of the Rings. Of course I’d read the book way back when I was young, and I’d even seen the Ralph Bakshi animated film of the first book, but for me it hadn’t matched up to the images Tolkien had created in my head. Like many people of that time, I had believed that a film of such an epic story could never be made. Again, like many people, I re-read the three volumes every few years just to remind myself of how great Tolkien’s vision was, and each time I re-read it, I learned new lessons at my stage in life that I hadn’t thought about before. But I digress. Not unusual for a dreamer like me. Back to you, Peter Jackson. Sorry, that should be Sir Peter Jackson. When your first LOTR movie hit the screens, I was amazed that someone had not only dared to do what couldn’t be done, but I was even more blown away by the fact that you had succeeded where so many others might have failed. But this time it wasn’t just for the special effects, the model-making, the revolutionary motion-capture or even the exotic locations. No, it was for the writing. Yes, Tolkien had penned a wonderful story, but it was what you did with it that made it come alive. For the first time I began to research the nature of screenwriting, and why some things that work in books don’t translate to the screen. Along with your two co-writers, Fran Walsh and Philippa Boyens, you had worked tirelessly to capture the essence of what the story was about in terms of individuals in a world beyond their control. Despite the film’s grand scale and epic tale, the very human-ness of the characters was what propelled the story. The words that Sam says to Frodo near the end of the second movie, “There’s some good in this world, Mr Frodo, and it’s worth fighting for” became a sort of mantra for me. I’m not completely certain whether these are Tolkien’s words or yours, but either way they echo Tolkien’s sentiment and you stayed true to the book. I began to read all the books about screenwriting that I could get my hands on, because they gave me a deeper insight into the nature of story and storytelling. Eventually, of course, this led to novel writing. I still use screenwriting structure for the novels that I write, and when I read a great novel that later dies on screen, I analyse the film in terms of that structure to find where the problems are. Since becoming a Jackson fan, I’ve also tracked down some of your other movies. I loved Heavenly Creatures and The Frighteners but I wasn’t that wild about King Kong. Maybe that’s because I’d never particularly liked the story. The romantic novelist in me has this notion about happy endings, and we all know that no matter what you do with it, you can’t give a story like that a happy ending. Oh, and by the way – I just love what you did with The Hobbit. Yes, all three movies. I have the first two on DVD and will get the third as soon as it comes out where I live. Sometimes I’d still like to run away to New Zealand and throw myself at your feet, Peter Jackson. Not because I’m a crazy stalker lady, but because I’d love to learn from you everything that you have to teach me about storytelling. In the meantime, I would happily give my all to sweeping your floor and making the tea at Weta Digital or Wingnut Films. Heck, I’d even get out the broom and rake and apply my sweeping and tidying talents to the gardens of Hobbiton if I could. I’ve been there as a gawping, bug-eyed tourist and loved every second of my visit. So, Sir Peter Jackson – how about it? 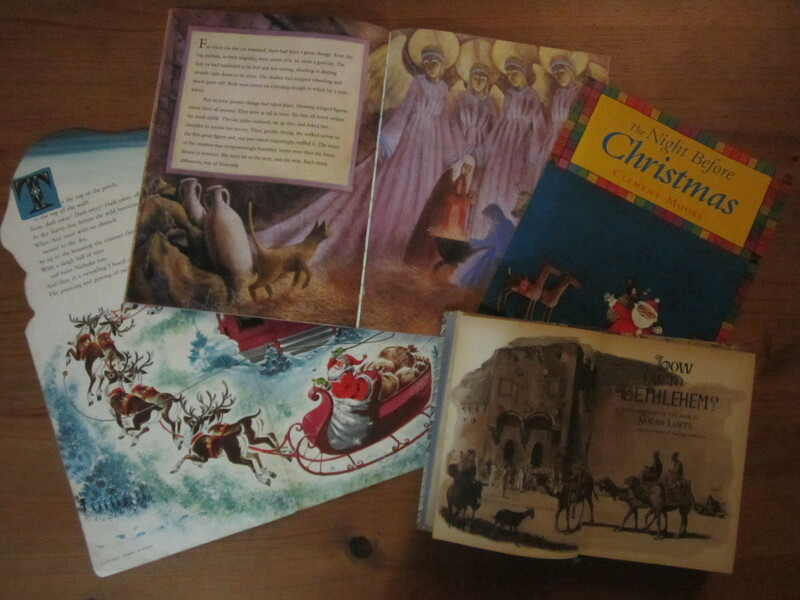 One of my earliest memories of Christmas was when a favourite aunt (who always gave us wonderful presents) gave my sister and I each a copy of Clement Moore’s famous poem The Night Before Christmas in the form of a book, beautifully illustrated by Florence Sarah Winship. These books were presents that we were allowed to open on Christmas Eve (all other presents had to wait till the next morning). They subsequently became part of every Christmas Eve thereafter, because before long we both knew the poem by heart and could recite bits of it at random. One Christmas Eve we dressed up as fairies (or was it elves?) and recited it to our parents from each side of the fireplace, next to the Christmas tree. We had copied the poem out onto handmade scrolls which we rolled importantly from one verse to the next. Some of these we spoke together, others individually. Rounds of applause followed and although the presentation may have been a little rough, we were extremely proud of ourselves! Years later while browsing in a bookshop, I found a newer copy of the poem, this time illustrated by Tomie de Paola. Of course I added it to my book collection. Sometimes during the pre-Christmas season I page through both versions in order to re-live a little of that magic from so long ago. I must have been about twelve years old when a teacher read us the Reader’s Digest abridged version of Norah Lofts’ How Far to Bethlehem? We were in a Christian school, so the whole class knew the story of the Nativity, but it was the different way in which it was told that appealed to us the most. This brings me to another favourite book which I found in the children’s section of a bookshop a few decades back. Having no children myself, my justification for buying it was so that I could read it to my sister’s children. I did. They’ve all long since grown up, but every year I take out that book and re-read it because I love it so much. It’s called The Witness, written by Robert Westall and beautifully illustrated by Sophy Williams. The Witness appeals to me because I love cats. It’s a secular story of an Egyptian cat far from her home, who gives birth to two kittens one harsh winter’s night while sheltering in a stable. Afterwards, she sees another mother – a human – who has given birth to a baby boy in the same stable. As a cat, she also sees the glorious angels hovering above the family of humans. The angels are amused that the animals can see them when the humans can’t. Some days later, after the kittens have grown a little, there is a visit from three rich men who bring costly gifts for the human baby. They have travelled through many lands and recognise that the cat is from the temples of Egypt. They also warn the humans about King Herod before they leave. To me, the magic of good storytelling is to take a story that may be familiar, but to tell it from a different point of view and provide a good twist to what might be a well-known ending. Wherever you are this holiday season, and whether or not you celebrate Christmas, may you have a peaceful time, and enjoy reading!